For over 27 years, Mr. Omelette has been the premier Omelette Guy in breakfast catering. Serving hot and delicious, fluffy omelettes paired with an additional gourmet spread is what we do best. If you are looking for breakfast catering that is sure to “WOW” at your next event or party in California, then you’ve come to the right place! 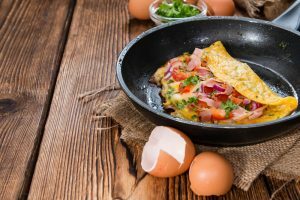 We offer many different options that can be prepared by our expertly trained omelette chefs and staff. 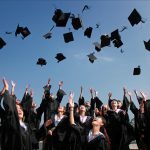 Whatever your budget or the size of your event, we’ve got your covered. 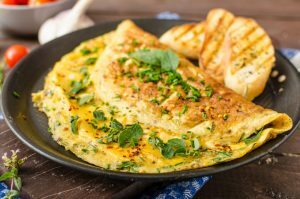 Here are just a couple of our customer’s favorite omelette menus. 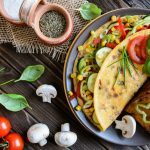 Omelette Selections – Our unique omelette selection ranges from smoked salmon and fresh avocado to mushrooms and tri-colored peppers and everything in between. Choice of One Salad – Choose from a fresh Greek salad, a crisp Caesar salad, or a organic spinach salad with your choice of salad dressings. Breads – This party also includes assorted bagels with cream cheese. 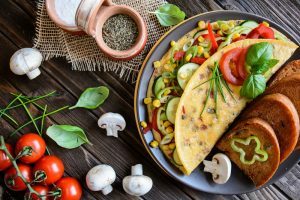 Find more information on pricing and additional or substituted items that can be added to your Modified Omelette Party, here. Starter Selection – Start your party off on the right foot with any of our unique starters, which include: a raw vegetable crudite with dip, imported and domestic cheese platter, and a selection of hot Hor d’Oeuvres. Pasta – You can choose our homemade Vegetable Neapolitan Lasagna to be served at your get together or choose another pasta from our Mrs. Pasta Party menu. Desserts – Treat yourself to mini French pastries, a fruit display with berries, and much more! Beverages – We supply your guests with coffee, tea, soda, seltzer, non-alcoholic mimosa and champagne mix. All alcohol is supplied by the customer. For larger parties of at least 75 guests, we are proud to supply our customers with our Mr. Omelette Party Deluxe package. We even offer a variety of menus for our customers who aren’t crazy about eggs like we are! From Omelettes to Pasta and everything in between, California’s Omelette man, Mr. Omelette can get the party started. Contact us today, for more information about booking us to cater your next wedding, bar mitzvah, or corporate event.